The 2018 edition of the Ryder Cup is quickly approaching us and it is shaping up to be a fiercely contested one. The United States are the current holders of the competition following their 17-11 victory over Team Europe at the Hazeltine National Golf Club in 2016, and will want to retain the trophy for the first time since the 1993 Ryder Cup. However, if history repeats itself then it’ll be unlikely the Americans will retain the cup as their last victory in Europe came in 1993. This year’s tournament will be held on the Albatros Course of Le Golf National in France for the first time in the tournaments history, and will be the second Ryder Cup to be held in Continental Europe. Despite the United States team having an awful record in Europe over the years, they surprisingly head into the tournament as favourites according to the Ryder Cup odds available on numerous bookmaker sites. From an outsiders perspective this might seem shocking, but if you look more closely into it then you get a clearer picture of why the Americans are rated so highly this time around. Since their Ryder Cup victory in 2016, American golfers have dominated in the following eight Major tournaments. Six of the previous eight Major winners have all been from America, with half of those titles going to Brooks Koepka. Although the United States team might come into the tournament as slight favourites, the Ryder Cup is always difficult to predict, and considering the American teams form in Europe in the past couple of decades, it is just as likely the European side are likely to regain the trophy from the Americans. 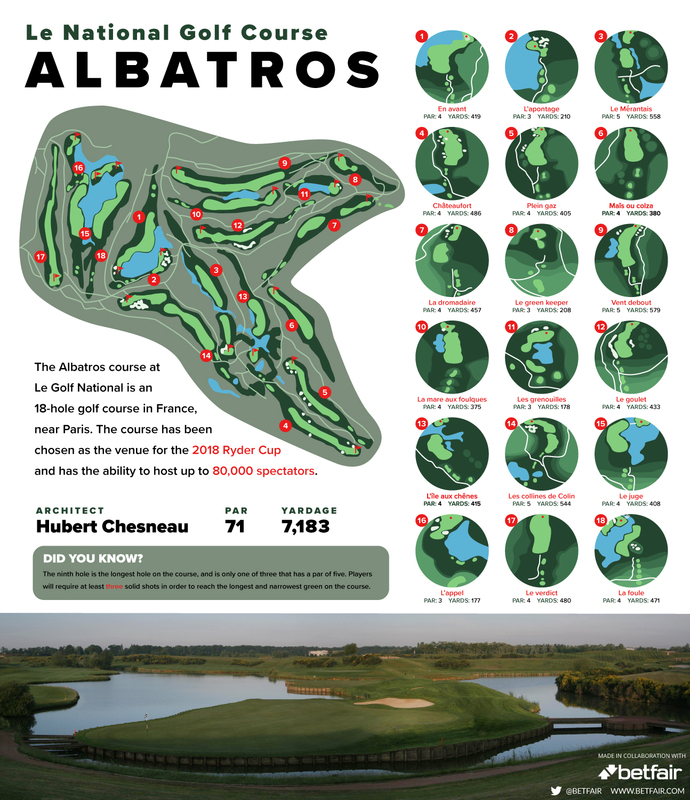 With the tournament just around the corner, this infographic has been created which gives you a run down on the golf course, giving you all the information you need to know about each hole including its length and par. Check it out!